The first order of business for Bart Wolf ’94 upon earning his business degree from St. Norbert College was buying a race car. That might not typically seem like the most appropriate use of funds for someone fresh out of college, but it makes perfect sense for someone with racing roots as deep as his. Wolf expected about 65 percent of the units would have interiors completed this summer, with the rest not far behind. Many of the owners live in warmer states during the winter, while some are Elkhart Lake residents already. Their high-end hobby features collector cars as well as active race cars. A significant business benefit for Wolf lies in the captive customer base he has for his expanded Wolf Motorsports shop, which sits on the south end of the development. The new shop is five times larger than the previous facility and is already full. The shop focuses primarily on race-car preparation, with some restoration capability. For as much success as Bart Wolf ’94 is having with his Motorsports Villas development, his true passion remains with race cars. The Wolf Motorsports teams prepare as many as 10 cars on race weekends at Road America. 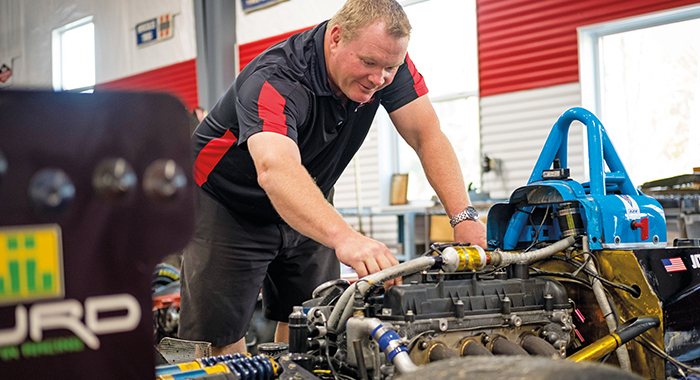 A shop that serviced three customers two decades ago now services 17, with some cars worth upwards of $2 million. In addition to mechanical expertise, the Wolf Motorsports team performs custom fabrication and machining, at times making parts that haven’t been made in 40 years. When Bart Wolf ’94 and his crew talked about finding the ultimate vintage race car to bring to their shop, the late Chicago Bears star Walter Payton’s Sports 2000 class racer rose to the top of the list. However, Sweetness’ car had dropped out of sight and finding it proved a challenge. Fortunately, an ad in a Florida publication looked promising and a check of the chassis number confirmed its identity. The car had been painted a different color, but Wolf and his partner were able to confirm its authenticity and bought it. 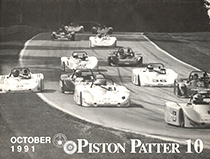 Wolf and his team were able to acquire uniforms from the early 1990s and wore them for the popular car show in downtown Elkhart Lake prior to the vintage car race at the track.